Who knew that advocating for your child could get messier than changing a eleven year old’s diapers? It goes to show you, I always have something to learn. In the current battle over words and an effort to bring attention to how the media handles hurtful “jokes“, I found myself defending my position to folks who I thought were on the same side of the issue as I am. I guess even in the community of people that are defending the rights of those with disabilities there is an us against them mentality that I really don’t get. Doing the semantics dance with self proclaimed “self advocates” isn’t irritating, it is aggravating. No parent wants to be accused of mistreating their child but to be accused of “placing focus on yourself rather than on the person it should be about” and the fact that I presume to speak for The Princess is so “offensive it makes me want to cry.” Unfortunately when I tried to reply, it had become very ugly. It became so bad that the original poster shut down comments making it impossible to respond and leaving whatever was said last hanging in the air. How does this happen? How do people who are fighting for the same thing (presumably dignity for people with disabilities) end up fighting eachother instead? If my daughter cannot self advocate, does that give permission for “self advocates” to exclude her or myself from the disability community? Since when does it change me from a tenacious caregiver to an offensive, selfish person? 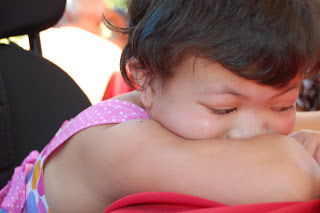 Why is the pain of watching my daughter being mistreated suddenly not appropriate? If I write and speak in defense of her dignity I am harming her in some way? At this point in time, The Princess cannot communicate in either written or spoken word. She cries when she is in pain, she screams when she is mad, she laughs when she is happy and she giggles when she goes fast or sees people dancing. The best comparison would be to say that her expressive ability is about the same level as a 4-5 month old and her receptive ability is around 3-4 years but that is extremely difficult to judge. So it is up to me, The Coffee Guy and any other caretaker to tune in and listen to what she wants or needs. It is at that point that one of us will use our voice to be her “voice”. 1. the sound or sounds uttered through the mouth of living creatures, especially of human beings in speaking, shouting, singing, etc. There are times when we all need someone to speak up for us. All children need this at birth, some will need it longer than others. Some folks will “tune into her frequency” but most of those providing therapies, services and education don’t have that kind of time to tune in, so I speak for her. I am her voice, not her mind, not her emotions and certainly not in this to be “coddled” or have the attention focused my way. I am in it because I was given the gift of a daughter who completely changed my perspective on parenting, friendships, faith, community and value. Sadly, these “self advocates” are only able to see their own struggles from their own perspective. Not one has admitted to being a parent. I am not in any way (nor have I read where any other parents who were advocating) saying that my struggle equals that of my daughter. What I am saying is that I know her struggle up close. I walk with her (figuratively) through her struggle daily and speaking for her is not something I take lightly. This type of thing is not just in the realm of families or persons with disabilities, I could list many groups that should be better at working out their differences in pursue the common good. Sadly, some aren’t able to let go of their own perspective in order to understand someone else’s. We let our tainted view or preconceived notions determine how we perceive others instead of opening ourselves to new possibilities. The irony is that this is what so many of us in the disabilities community fight for continually. We want ourselves, our children or loved ones to be seen as more than their diagnosis or their thought process or even their equipment. We are all on the same side. We may be standing in different places with our own perspectives but we are fighting the same enemy so we owe it to ourselves and those we are advocating for to join forces with respect and compassion to those who really are on our side. After all, I value the perspective of someone who is able to use their own voice!